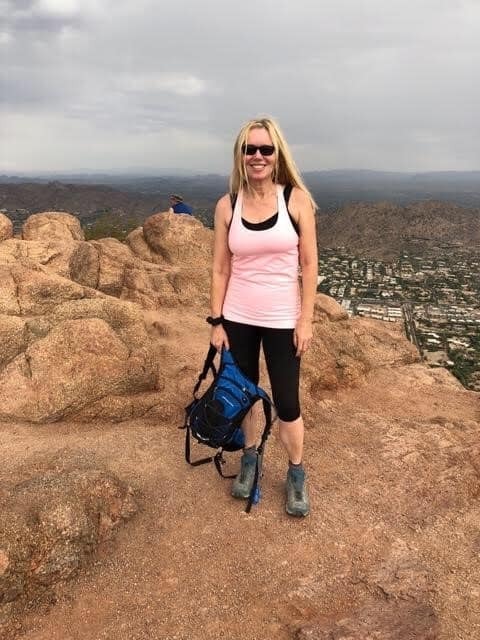 Pat Rubel is an avid traveler and novice hiker determined to make every day an adventure! Pat is a business owner who’s been married to her husband of 33 years. She has three adult children and one adorable grand-baby. Her message to people of all ages is to say YES to adventure. 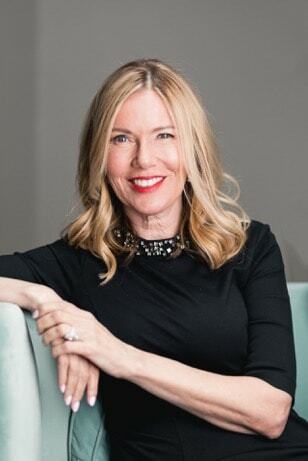 When I met Pat Rubel, I quickly realized that she lives a Risk Blossoming life. That makes why we asked her to be a Risk Blossoming Guest Blogger! 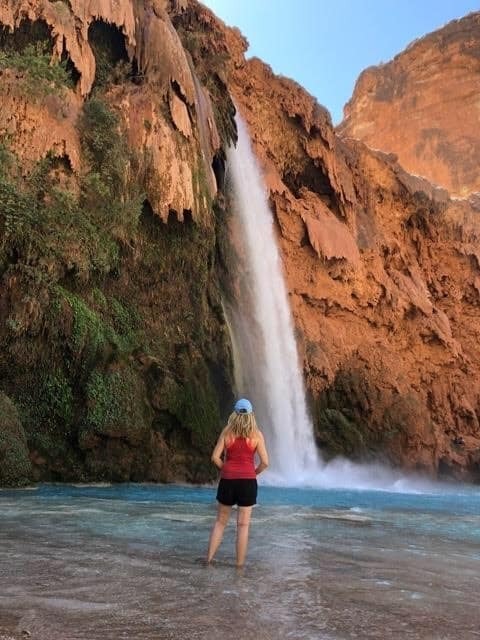 Pat says she decided to get in shape and take up hiking at the “ripe old age of 57.” Since then, she has hiked in Phoenix, Sedona, Flagstaff, Aspen, Durango, Monument Valley, Moab, Edinburgh, Budapest, and Havasupai. She is currently at work planning her next adventure. We are excited for you to “meet” her. Her zest for life and her “Lessons Learned” will inspire you!! Follow Pat on her blog at The Patrish Pages or on Instagram, @patrishpages. 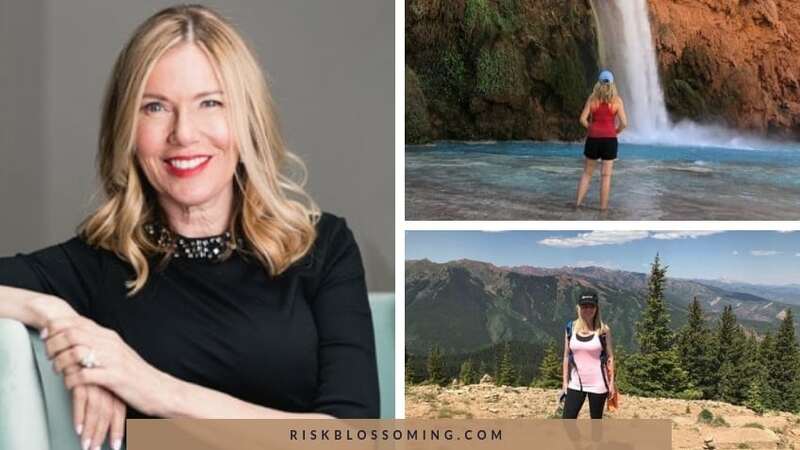 When Deborah asked if I would write about my hiking journey for Risk Blossoming, I was flattered. At the same time, I was not really sure if my story would be interesting enough. But the more I thought about it, I realized the heart of my story isn’t in hiking skills or tutorials. My story is about taking risks, trying something new and keeping an adventurous spirit, no matter what age. 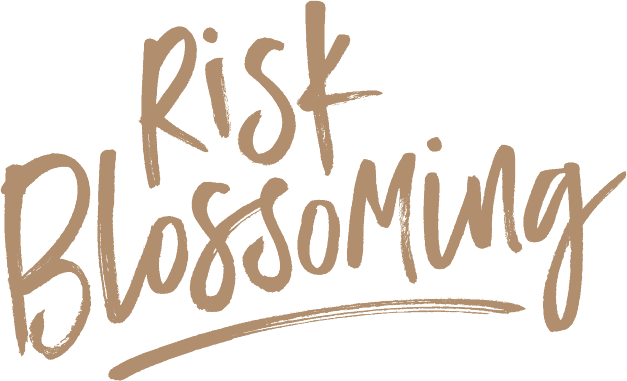 That is the essence of Risk Blossoming. It’s about getting out of our comfort zones and living life to the fullest. I jokingly call myself the Reluctant Hiking Diva. Eight months ago, I was having wine with some girlfriends. We started talking about how fun it would be to plan a girls’ hiking weekend. After a few bottles of wine, it began to sound like a good idea. I mean, who doesn’t think about starting a new athletic adventure at the ripe young age of 57? So we set a date to do a few day hikes in Sedona in 6 weeks’ time. Our end goal was possibly hiking somewhere in the Grand Canyon in the fall. All five of us were over 50. Only one friend had hiking experience. The rest of us were dreadfully out of shape. But we were also excited for a brand-new adventure and all the challenges that came with it. Hiking in Phoenix for the First Time. Piestewa Peak. We decided to meet up every Saturday morning. We’d hike as a team to help each other stay motivated. I’m not an athletic person by nature. I thought that some low-key hikes would be an easy way to start. That first Saturday morning was a big wake up call! We met to climb Shaw Butte Mountain, a beginner-level trail. I only made it half way up. My lungs were burning and my legs felt like jelly. I realized this challenge was going to require a lot more effort than I originally thought. Then a familiar frustration started to creep in. 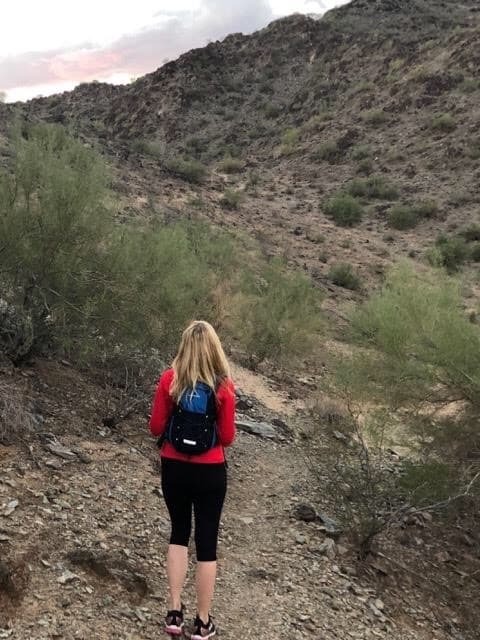 I’ve lived in Phoenix my entire life and have never hiked any of the area mountains. My idea of hiking? Walking from one end of the mall to the other, with a stop for lunch at the food court! I’ve lost count of the gyms, yoga studios, and exercise programs I have joined and quit. With this new hiking goal, I was seriously in over my head. I had committed to something that was way out of my comfort zone. I had two choices. I could bow out of our hiking group and continue my life as it was. Or, I could fulfill my commitment and push myself more than I ever had. A Hiking Journey Begins. Sedona. Somehow, I managed to stick with it. For the next 6 weeks I hiked every Saturday with my team of 5. During the week I tried to hike on my own before work. For the first time in my life, I explored some of the beautiful local trails near my home. 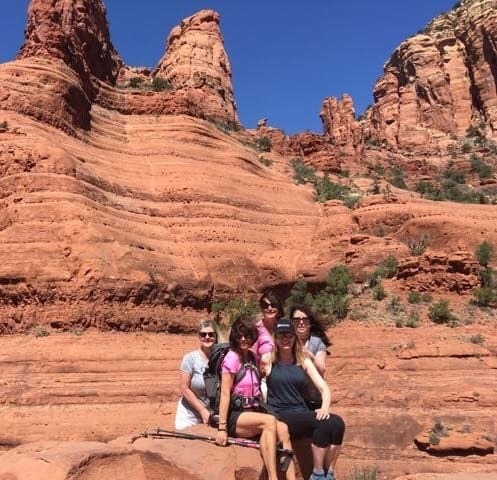 By the time we went to Sedona, I felt much stronger. I was excited to see some of the beautiful trails that I’d only read about. Sedona was a blast! The hikes were relatively easy, and we stayed at an adorable Airbnb. It really was a perfect girls’ weekend. All my training was paying off. I finally felt like I was in reasonable athletic shape and enjoyed being outdoors. 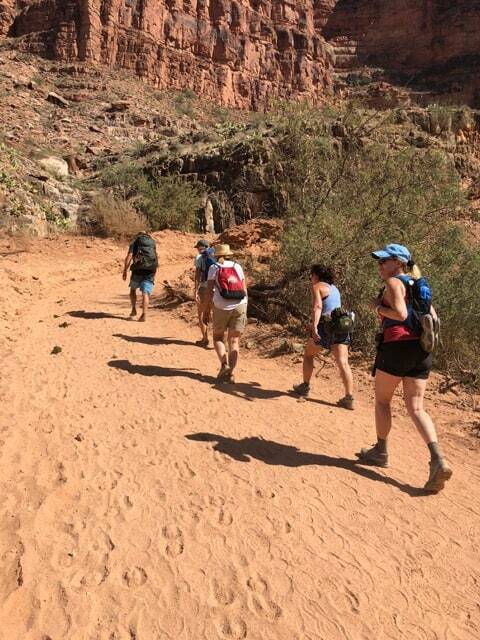 By the time we returned to Phoenix, I knew I was bitten by the hiking bug. 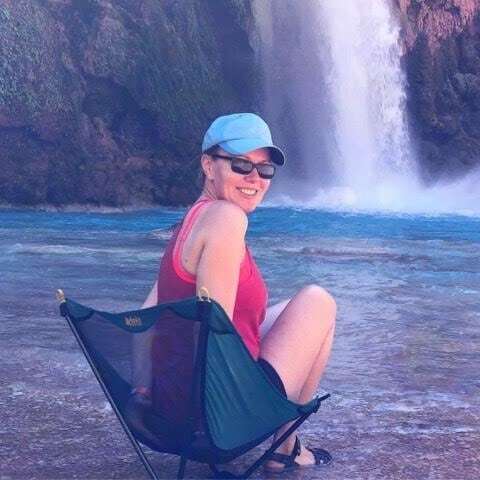 Then I had the opportunity to commit to a 5-day, 4-night hike through Havasupai Falls in September. I said yes without hesitation. I was high with excitement about this beautiful hike. After all, even some of the most experienced hikers around haven’t tried it yet. Everything was great until I got the paperwork with the trip details and I finally saw everything involved. I immediately realized I might have said yes too quickly! It turned out that only one of my girlfriends from my original group could join me. 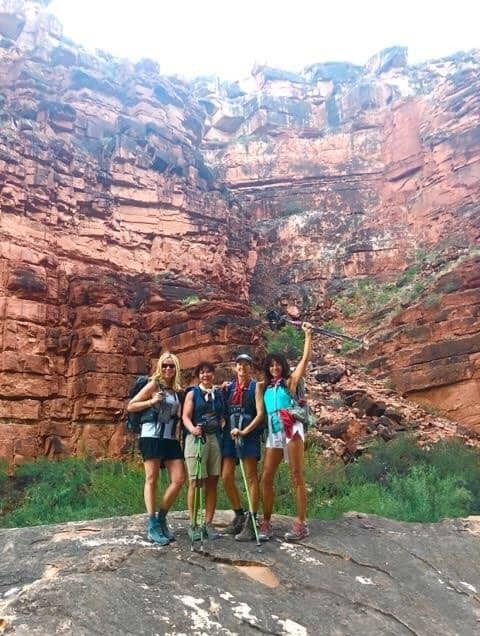 I would be hiking with a guide and 4 other women who were all amazing athletes. I also found out that we would be camping, and I had never camped a day in my life! My idea of camping was staying a Motel 6. My list of new concerns continued to grow. Just how many miles would we cover? How would I handle sleeping on the ground, no hot showers, no restaurants, and God forbid, outhouses? There was another complication in my training. My summer was packed with trips I’d planned far in advance of my new hiking adventure. I was worried I wouldn’t be able to train enough to be in shape for Havasupai. My only solution was to find a place to hike or walk everywhere I visited. 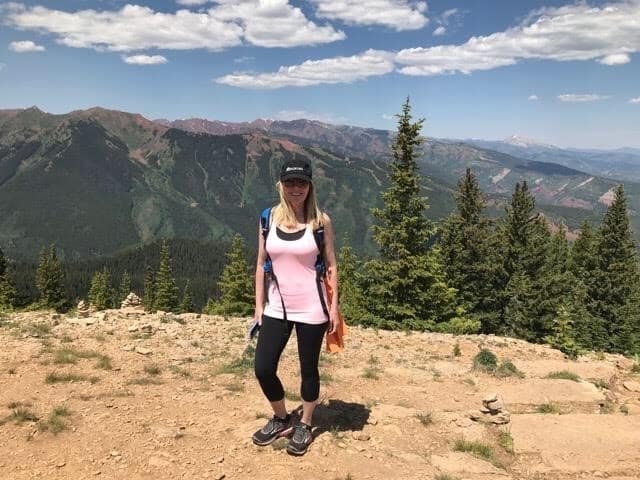 When I was in Aspen, I spent more time walking beautiful trails then I did in town. In Chicago, I made myself walk at least 5 miles a day and take the stairs whenever possible. In Budapest, I climbed the road to the Castle on the Pest side of the Danube River. In Edinburgh, I walked everywhere I went, no cabs allowed. I was excited to find a place to hike just outside of Edinburgh called King Arthur’s Seat. The local people called it a “wee hill.” I called it exhausting! I also realized there was a language barrier. Apparently we define the word “wee” very differently. 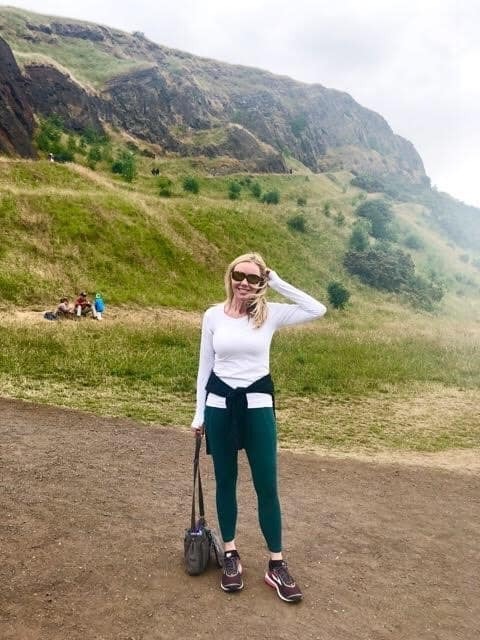 Hiking King Arthur’s Seat in Edinburgh. It wasn’t “wee” to me! When I finally returned to Phoenix in August, I had a looming 6-week deadline. I had tried to stay in shape during my travels. The truth was that walking from pub to pub in Europe may not have been the best plan. It was time to get really serious. If you have never spent August in Phoenix, you are lucky. The average daily temperature is about 110 degrees with lows in the mid 90’s. In other words, if you want to hike and not die of heat stroke, you need to adapt. You must be up before the sun and try to finish your hike shortly after sunrise. I am someone who was not and will never be an early morning person. This time schedule would require serious self-discipline, something I was not accustomed to. My alarm clock went off at 4:45 am 4 days a week. Only one thing kept me from throwing it across the room. I didn’t want to be the only person on my team who couldn’t keep up the pace. Who said peer pressure is a bad thing? The Real Training Begins. August Morning Hikes. All of August and half of September, I dragged my sleepy self to every local hiking trail I could find. 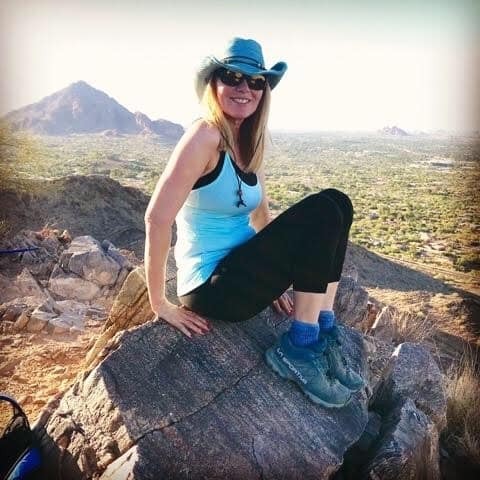 I did steep hill training at Piestewa Peak and the back trail of North Mountain. I did distance and endurance hikes around Shaw Butte and the 100 trail that connects mountains across the city. A few days felt like I was living out my own personal “Fear Factor.” Early mornings bring out not only hikers desperate to escape the heat, but also wildlife big and small. One day I encountered a wild coyote, a scorpion on my backpack, and a rattlesnake, all before 7 am! I have never moved more quickly in my life. Fear is a marvelous motivator! As the big hike got closer, I started to feel physically stronger. I was also excited to get some real supplies for my adventure. 2018 will forever be known for two reasons. First, it was the year I said “yes” to adventure. Second, it was the year I spent more money at REI then I did at Nordstrom! I kept rearranging my gear in order to keep my pack under 22 pounds. Unfortunately, water weighs a lot. Three liters of water is the minimum you need for the 10-mile hike to the campground. Water takes up a lot of space too. I finally narrowed down my necessities. 2 pairs of shorts, 4 tops, one toothbrush, baby wipes, water shoes, power bars, Motrin, sunscreen and antibacterial lotion. I have never traveled without makeup, moisturizer, and perfume. I guess there is a first time for everything. Graduation Hike. Camelback Mountain with a 20 lb. Weight in My Backpack. I am a natural worrier. Taking a risk for me usually meant wearing 4-inch heels to a party or wearing purple nail polish. I woke up at 2 am every day the week before leaving for the trip worrying. What if the two women on my team I haven’t met don’t like me? What if I get appendicitis? What if I get a cold? What if I hate the food and starve to death? The day we began our descent into the canyon was perfect. We left before sunrise and I had never felt stronger or more excited. I had no idea that two miles in my real adventure would begin. 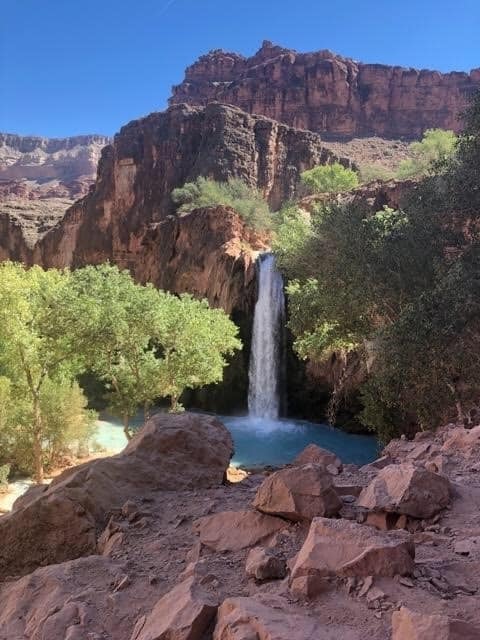 Havasupai Falls is part of the Grand Canyon. 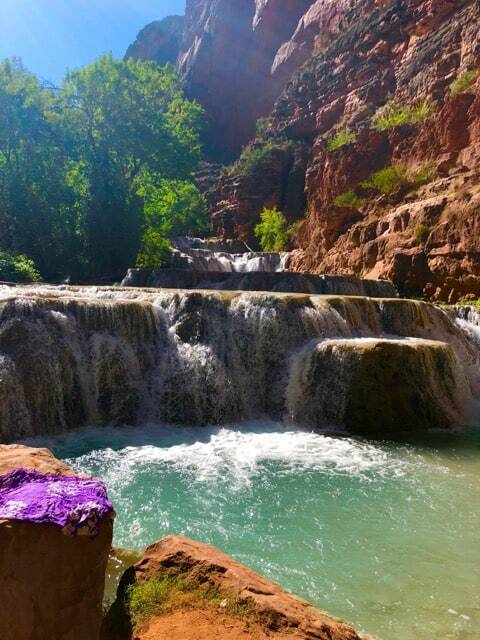 It is in the Havasupai Tribal Indian lands and is completely controlled by the Havasupai Indian People. There are five main waterfalls and a number of smaller falls located off the side canyons. There is a drop of over 2,800 feet in elevation down to the falls. The majority of that drop is within the first mile and a half. 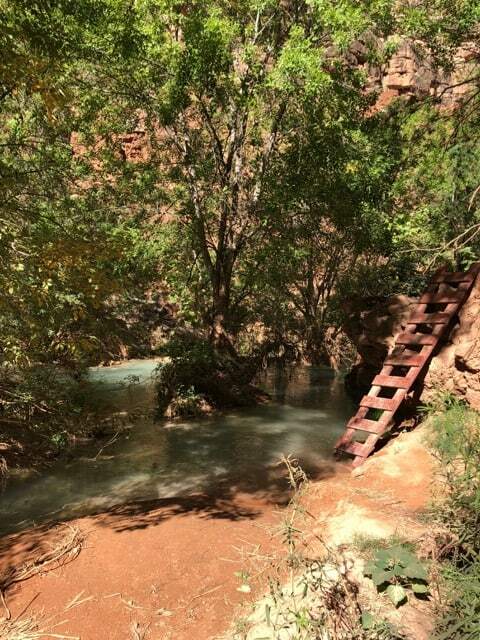 The village of Supai is 8 miles into the canyon. The campsite is a long 2 miles from there. The hike is long, hard and hot. Yours truly managed to slip on river rocks only 2 miles in and badly twist her ankle. All the training and hard work almost ended in one split second. No Glass Slipper for Me. It Wasn’t My Best Cinderella Moment. The key word here is “almost.” I knew without a shadow of a doubt that I was not giving up. I needed to push through my pain and finish what I had worked so hard for. I had to dig deep and find an inner strength I didn’t know I had. I continued to hike the next 8 miles until we made camp. When I took off my hiking boot, my foot was swollen and beginning to turn black and blue. I knew that my ankle wasn’t broken because I could put weight on it. That knowledge didn’t alleviate any of the throbbing pain. It was too late to turn around and go back. My only option was to take Motrin. Then I soaked my foot in cool spring water and tied my hiking boot tight for the next 4 days. It really was mind over matter. Not giving into the fear of pain was a huge accomplishment for me. I somehow managed to hike to all 5 of the falls, albeit not gracefully. I also discovered a fear I didn’t know I had, of heights and ladders! Hiking is usually a slow ascent and descent with a lot of switchbacks. It wasn’t typically rock climbing sheer cliffs. 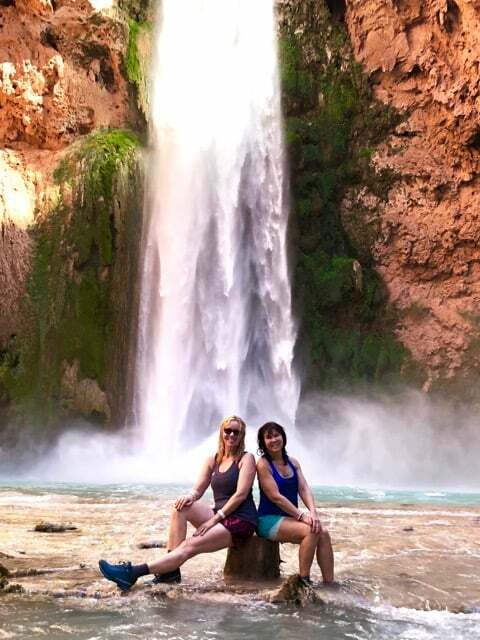 But to access the two most beautiful falls, Mooney Falls and Beaver Falls, you have to work. You must climb down a 200-foot cliff using metal chains, go through two tunnels, and hold onto rickety old ladders. Beaver Falls, 3 tiers of unbelievable beauty! 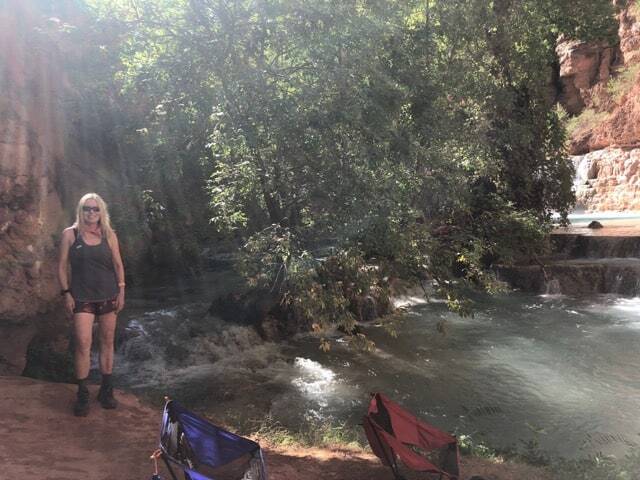 Mooney Falls, I made it down the cliff. I’m sitting because my knees were still shaking! Made it. Soaking my foot in the cool waters. 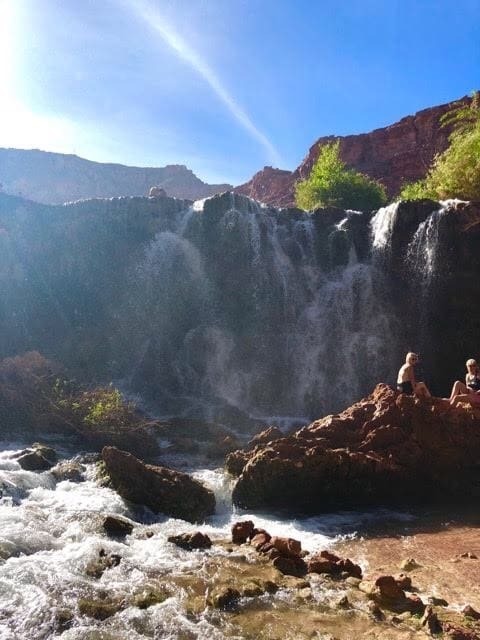 These Waterfalls are worth the View! When I was younger and wanted to do something risky, my parents has a typical answer. They’d say, “If your friends jump off a cliff, are you going to follow them?” The smart answer is “of course not!” But for once, I didn’t do the smart thing. 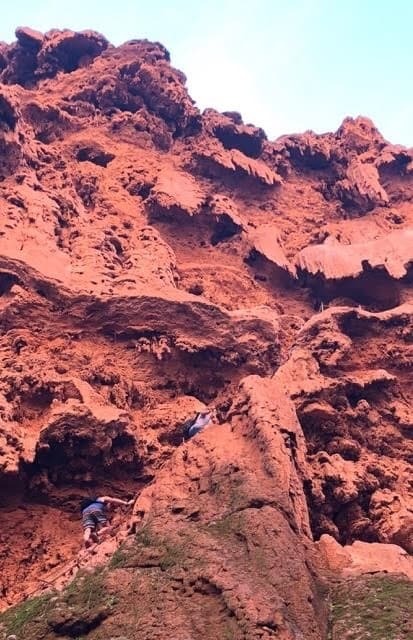 Instead, I took the risk and followed my friends over the cliff. I’m so glad I did. Experiencing Mooney and Beaver Falls has been a high point of my life. 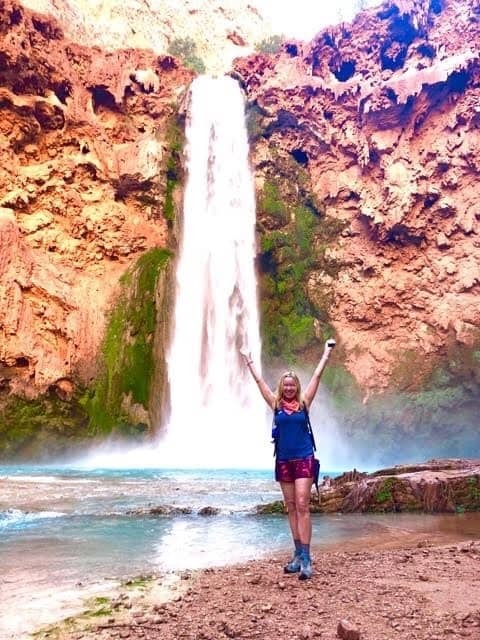 The beauty and power of these waterfalls literally took my breath away. Ok, maybe the shortness of breath was really just me hyperventilating out of sheer terror! I wouldn’t have it any other way. I learned a lot about myself by taking a risk on the adventure of a lifetime. I learned that I am stronger and more disciplined than I had given myself credit for. I learned that I really like seeing beautiful natural wonders. And I learned that I am not a fan of camping. But the most important lesson was that we need to allow ourselves to be adventurous and take a risk. Whatever your heart is calling you to do, just go for it. If we wait for the perfect time in life that time never really comes. The time to follow your dreams is now. It is never too late. If I can do it anyone can. Take the risk and create your own adventure!